Today's bridge is the most iconic structure in Calaveras County. Its a long timber trestle bridge with a single span T girder frame over State Route 49. The bridge was once part of a railway line that carried the Southern Pacific railroad from Valley Springs to the cement plant south of San Andreas. More information on the cement plant can be found at the Stone Quarries and Beyond Website. 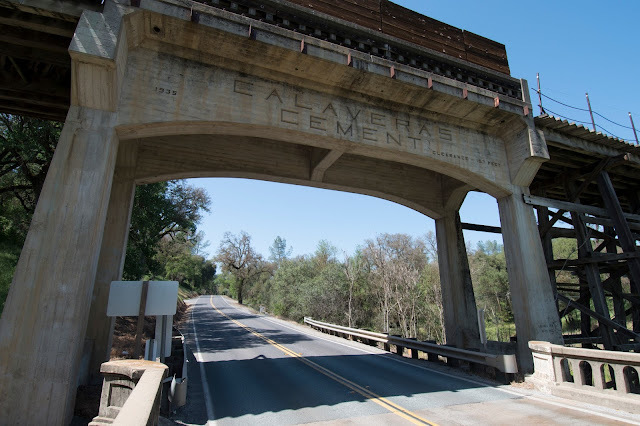 The Calaveras Cement Company Underpass (30 0039Z) has a 40 ft long span over the highway and it was built in 1935. The National Bridge Inventory/Uglybridges Website reports that it currently carries 6950 vehicles a day which seems much too high. That must be the number of vehicles that go under the bridge each day. Calaveras County, California Bridges: Calaveras Cement Company Underpass by Mark Yashinsky is licensed under a Creative Commons Attribution-NonCommercial-ShareAlike 3.0 United States License.